When Star Wars became the smash hit of 1977 by turning B-movie adventure into big-budget spectacle, drive-in mogul Roger Corman saw the writing across the stars. The producer and former director had made his share of drive-in science fiction and space adventures, but they had all been cobbled out of spare parts and imaginative art direction, with simple miniatures and animation providing the space ships. Now Hollywood was moving in on his brand of genre filmmaking and action fantasies with budgets he couldn’t match and he needed to raise his game to meet them. 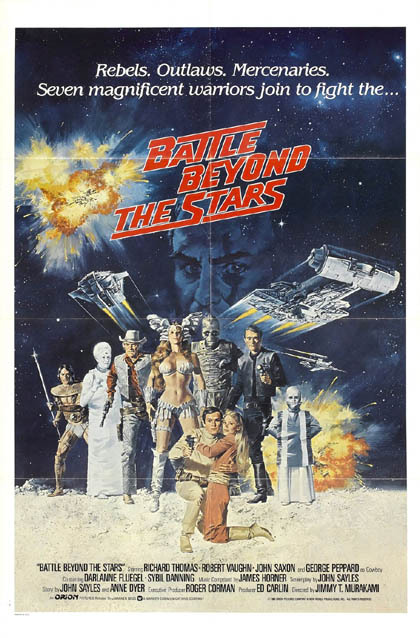 Battle Beyond the Stars was Corman’s answer to the new Hollywood sci-fi blockbuster. The script is from John Sayles, whose screenwriting apprenticeship came from such Corman productions as Piranha and The Lady in Red, with a story credit shared with Anne Dyer, but the concept was from Corman himself: “The Seven Samurai in Space,” with a few hints of Star Wars tossed in around the edges. Richard Thomas, fresh off six seasons of the folksy family TV drama The Waltons, plays the film’s innocent, idealistic hero Shad. He’s Luke Skywalker by way of John-Boy, a farmboy on a peaceful agrarian planet that looks like a counter-culture commune in ancient Greek garb. When the vicious warlord Sador (John Saxon) brings soldiers and his answer to the Death Star to their planet and gives them seven days to surrender, Shad sets out in a talking space ship (in the tradition of referring to vessels in the feminine, this one quite literally has a voluptuous pair of breasts protruding from the bow) to hire a fighting force of mercenaries to defend themselves from the invasion. After a detour at a nearly abandoned space hub, where he manages to recruit the only single girl (Darlanne Fluegel) his age in the region, he starts putting together his team: a drawling smuggler who goes by the handle Space Cowboy (George Peppard, offering the film’s answer to Han Solo), a lizard-like slaver with a grudge against Sador, a hive being of multiple clones in search of new sensations and experiences, a pair of heat-producing beings known as The Kelvin, a buxom Valkyrie warrior (Sybil Danning in a costume that barely covers her) in a mosquito of a fighting ship seeking battle glory, and in the film’s inspired casting coup, Robert Vaughn as a jaded bounty hunter who joins their fight in exchange for “a meal and a place to hide.” It’s the same role he played in The Magnificent Seven, the original western remake of The Seven Samurai. Corman also casts a pair of respected Hollywood greats in small roles: Oscar nominated actor Sam Jaffe as a mad scientist who has wired himself directly into his space station and legendary acting teacher and character actor Jeff Corey as the blind tribal elder.